"What the viewer will encounter in the galleries is therefore the product of a process of dialogue, rather than purely curatorial choice. Besides introducing this excellent group of artists to the art market, the AIM program also attempted to connect them to a broader circle, which besides their own peers included the eight foreign artists who participated in our International Residency Program; the two guest curators, Wayne Northcross and Jose Ruiz, the curatorial team at Wave Hill, Jennifer McGregor and Gabriel de Guzman; and our own curatorial fellow Lia Zaaloff. The process of structuring the biennial also engaged Christian Viveros-Faune as the Bronx Museum's first Art Critic in Residence. 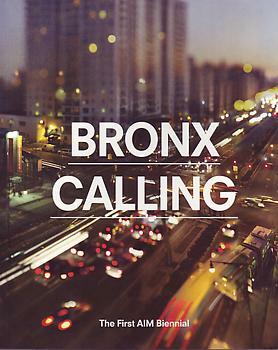 Bronx Calling: The First AIM Biennial therefore asserts its uniqueness through the sheer power of the emerging scene-a truly essential resource in New York cultural history."